The transformation of normal melanocytes to melanoma cells is associated with accumulation of genetic alterations that impact directly and/or indirectly on cell cycle regulators. As a result, melanoma cells acquire the ability to proliferate and resist apoptosis regardless of environmental cues that control normal melanocytes. Although the full scope of the mutations acquired by melanocytes in their malignant progression has not yet been elucidated, the few that have been identified are in regulatory proteins that control cell cycle progression. The transition to self-sufficiency is a step-wise process, initiated as melanocytic lesions advance from benign to dysplastic nevi, to primary superficial spreading melanomas, and further on to invasive, nodular and metastatic lesions (1,2). This aberrant self-proliferating loop is likely to play a role in fixation and propagation of oncogenic mutations (3). Any mechanism-based approach for melanoma therapy requires the detailed knowledge of the critical players in maintaining autonomous cell proliferation. For example, up-regulated activity of receptor kinases has been implicated in the progression of numerous tumors (4). Prominent in this category are receptors from the epidermal growth factor receptor (EGFR) family, such as Erb-2 (also called HER or Neu), a tyrosine kinase receptor, which is overexpressed in 20 to 30% of human breast and ovarian tumors (5–7). 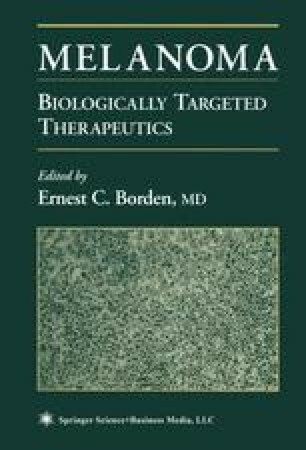 Erb-2 is the target for current and future therapeutic strategies (8), such as the use of neutralizing antibodies or specific kinase inhibitors (4, 9,10). Another example is bcr-abl fusion gene, a hallmark of chronic myelogenous leukemia (CML), which encodes the constitutively active abl-kinase fused to Bcr. A competitive inhibitor of the Bcr-Abl kinase, STI571(CGP57148), is currently one of the most promising treatments of CML (11–15). The discovery of the kinase inhibitor CGP57148, as an effective tumor suppressor specifically for CML, serves as an example for a successful logical mechanistic approach and provides the impetus for searching specific signal transduction targets in other cancers, including melanomas. In fact, as will be described here, investigators and pharmaceutical companies have already developed several inhibitors that target various intermediates in growth factor-mediated signaling, and some of these compounds are already in clinical trials (4,16,17).